Richard & Ina Balash – Invest. Connect. Lead. 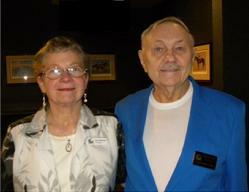 The Richard & Ina Balash (RIB) Scholarship was created in 2003 by Richard and Ina Balash. It was their belief that most scholarships were available to high grade point students as well as some low grade point students based on low income or particular family situations. The RIB scholarship was aimed therefore to include students in the middle grade point range.